Beauty is not just skin deep.Just ask Sarah Lahbati, one of the most beautiful stars in Tinseltown. Better yet, get a copy of her first book, True Beauty: How To Glam Your Life Inside And Out. In it she details all the difficulties, struggles, and hardships she has gone through from her awkward childhood days to her tentative teen years and beyond. And she shares all the triumphs she has had in overcoming self-doubt as well as the lessons she has learned that helped her become the confident young woman that she is today. Beneath the glamor, Sarah's life has not at all been trouble-free. She may have emerged as the ultimate winner in the TV talent search that launched her career, but the journey getting there started out in the most heartbreaking, catastrophic way as her audition fell on that fateful day of Typhoon Ondoy. In this book, Sarah recalls the devastating sights she witnessed, the emotions she felt, the things she endured, and what made her trudge on in spite of it all. In one of the 11 chapters, you'll also find a story about her encounter with a bully and how she prepared herself to stand up against anyone who would pick a fight with her. Then, she talks about her "ugly phase", and gives tips on how to feel confident about your looks regardless of your age, height, weight, and complexion. There is a lot to learn about fitness and fashion in "True Beauty", but it doesn't stop there. Sarah gives a visual treat of the places she has visited. Her love for traveling started when she was a child, thanks to her parents who took her on holiday trips outside Switzerland and the Philippines. She sees the importance of traveling in widening the mind - learning about people, cultures, nature - and she shares her must-do things to make the most of every trip she takes. Sarah's book will not be completed without her love story. How did her friendship with Richard Gutierrez turn in to courtship? What was it like meeting his family for the first time? How did her own parents react to her relationship with the man who would become the father of her child? Sarah proudly and lovingly describes Richard beyond his boy-nextdoor charm, thus making us see what she values most in a man. For the single ladies, she provides a check list that may help in determining if the man who is trying to sweep you off your feet is truly "The One". 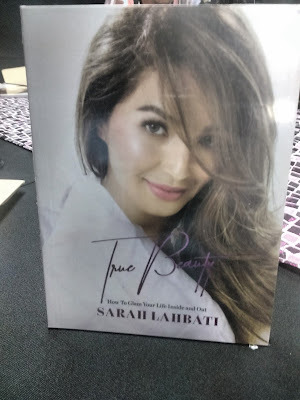 "True Beauty" also touches on Sarah Lahbati's passion for performing, the lessons she learned from life's challenges, finding inspiration and spreading positivity, and many more. It shows why she is now a picture of happiness.